Over the past few years I’ve been running this site, I think I managed to cook most of the main dishes and soups I remember from my childhood growing up in Slovakia. But one thing that’s still missing – and one that is a huge part of the Slovak kitchen – are the various sweet cakes and tortes. The variety and quality of cakes in Slovakia is top notch! So my goal for now is to learn to make at least few of these. And hopefully let you recreate these in your own kitchen. Yesterday I ended up making these delicious strawberry cakes. I saw a picture and recipe for them in Slovenská Kuchárka by Mária Szemesová and they looked so good that I decide to try to make them. 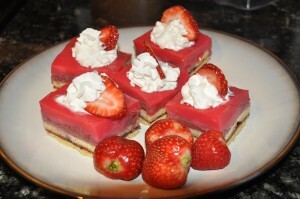 The original name is jahodové rezy, which means something like strawberry slices. I made few adaptations along the way – namely I ended up reducing the amount of flour by half, and also added milk to the filling. 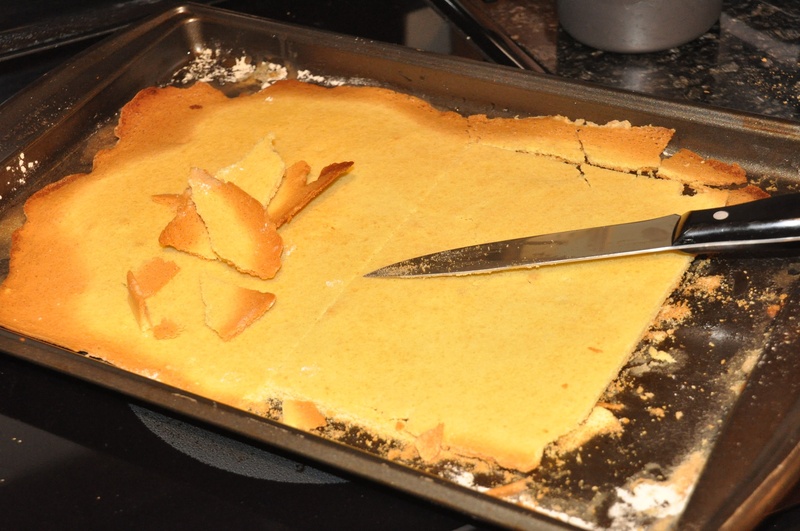 My first cut, using the flour as noted, resulted in the dough being way too thick. 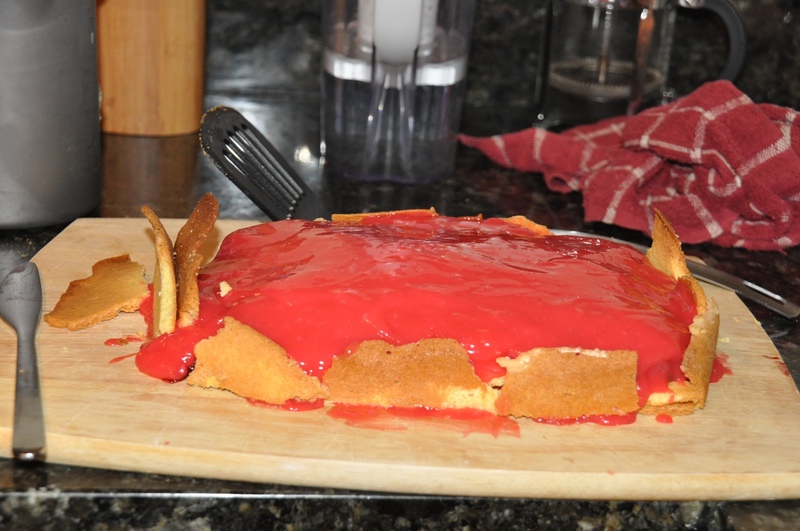 To make this cake you will need strawberry compote. You may get lucky and just find some canned strawberries in the grocery store, but if not, why not just make your own? It’s easy. First, preheat the oven to 420F. Then combine whole eggs and sugar and beat until thick. 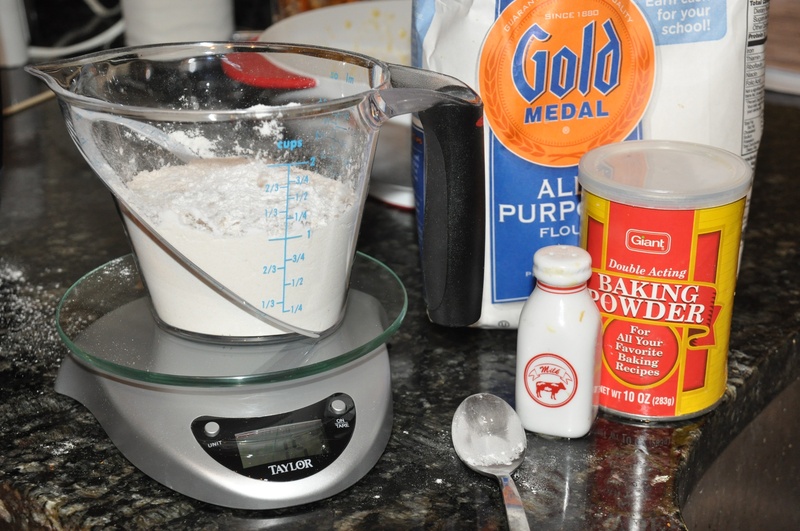 Next combine the flour, baking powder, and a pinch of salt. 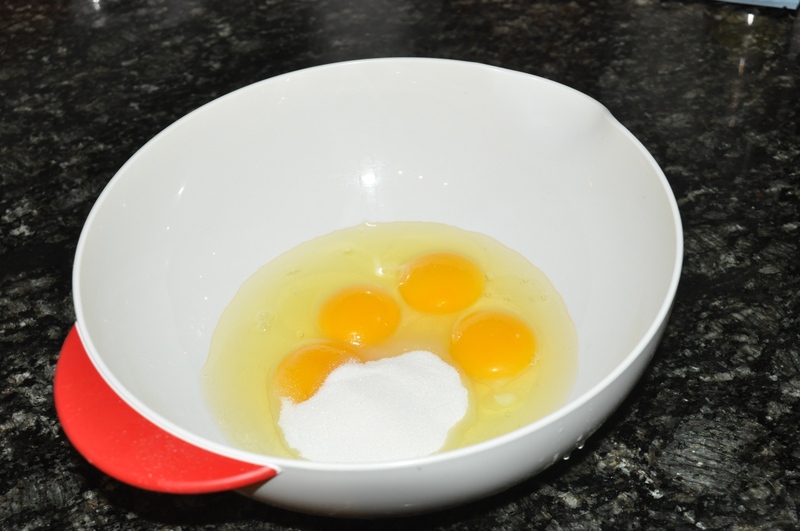 Slowly add the flour to the beaten egg mixture through a strainer while mixing. 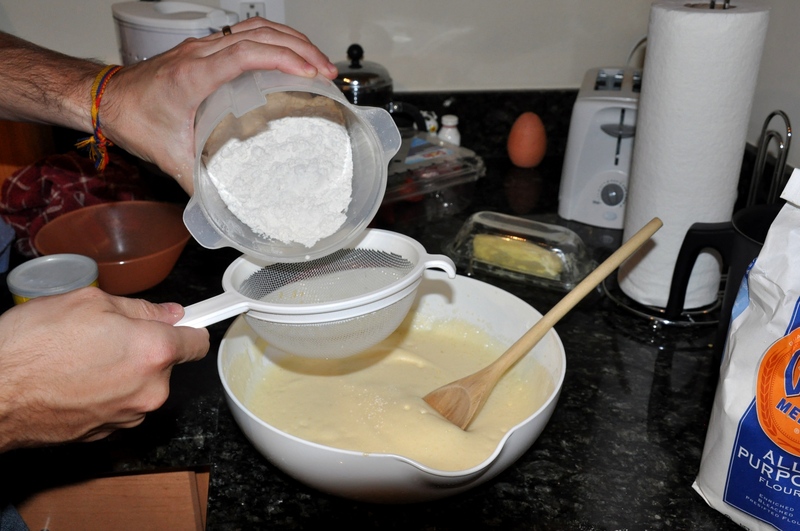 Keep adding the flour mix until the dough is the consistency of thick syrup. It should be thick, but no so thick that it doesn’t flow. 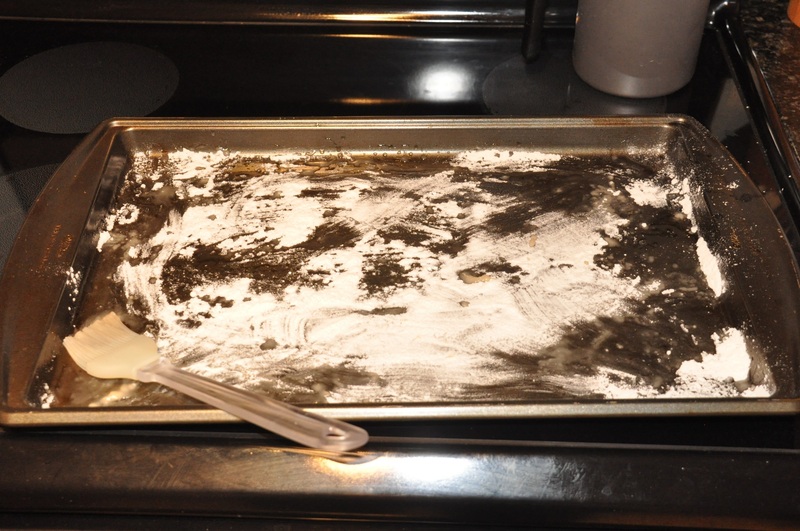 Next grease a baking pan with oil and also dust with flour. 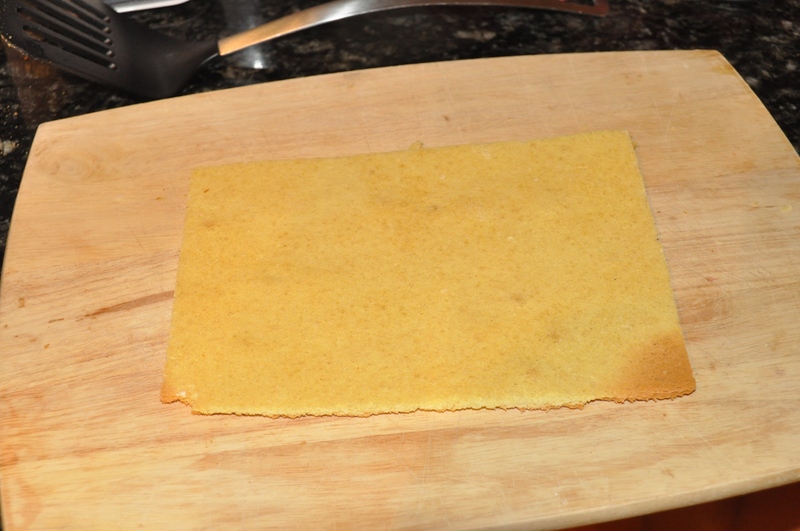 Pour the dough and spread so you get an even layer about 3mm thick. 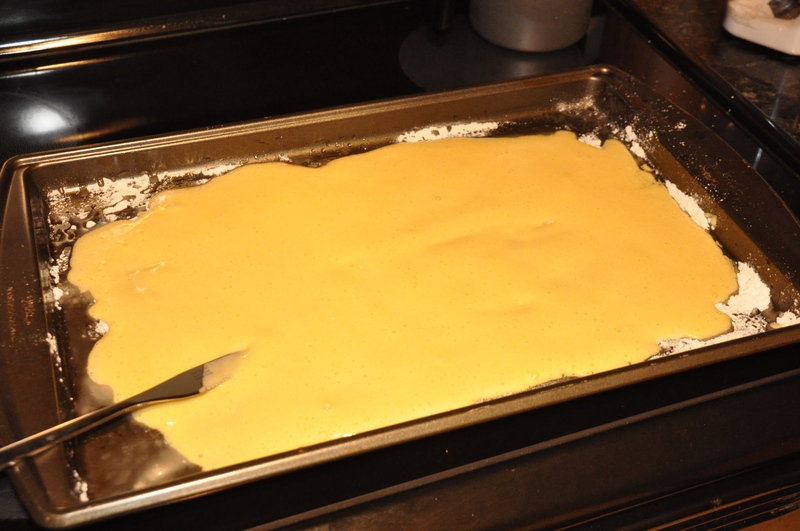 Bake in an oven preheated to 420F for 5 minutes. Then reduce the heat to 350F and continue baking until the edges turn brown (about 20 minutes total). In the meantime, we will make the filling. 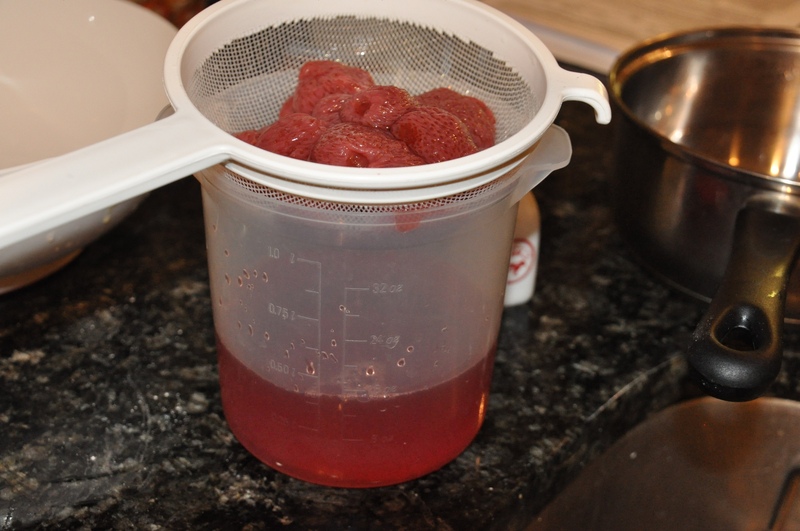 Strain the compote, you should have about 16oz of liquid. 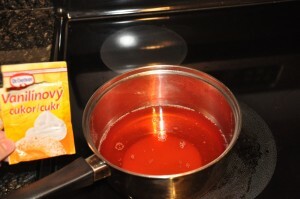 Pour half of this into a pot, add the vanilla sugar, and bring to boil. 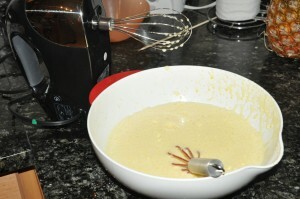 Whisk in the corn starch into the other half. 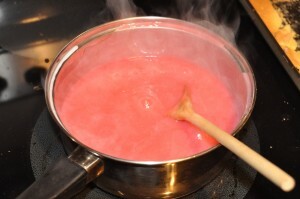 When smooth, add to the boiling mixture. You will now want to “season to taste”. I used some wimpy strawberries from the grocery store when making the compote instead of getting good ones from some farm, as our grandparents would have done. They were both quite sour (not ripe) and also light in color. So I added more sugar and milk to make the taste more mild. 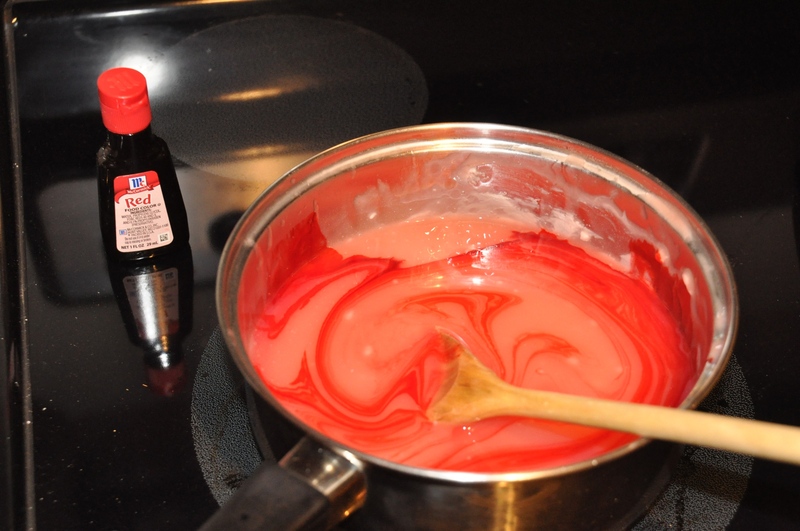 I also added bit of red food coloring. Also add more corn starch as needed, but be warned that it may curdle (this happened to me). 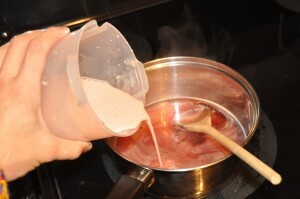 If it does, simply run the pudding through a strainer while it is still liquid. Continue stirring the pudding until it starts to thicken. Then turn off the heat and let cool down a bit, but no so much that it turns hard. Take the dough and carefully cut out from the pan if it has stuck (mine did in few spots despite all the flour and oil). Cut the cake in two halves. 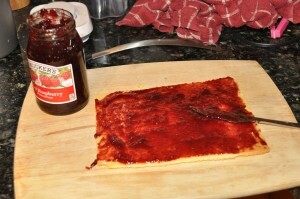 Join the two halves together with a layer of raspberry preserves. 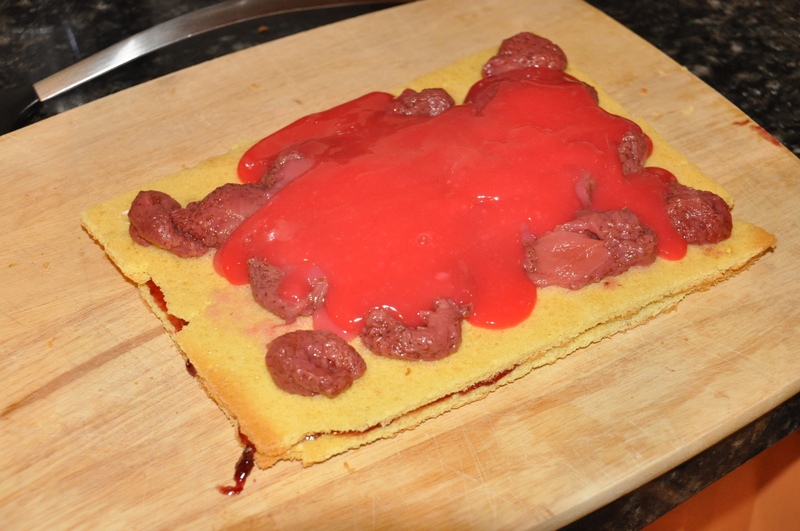 Spread the compote strawberries on the upper layer and then gradually add the pudding. 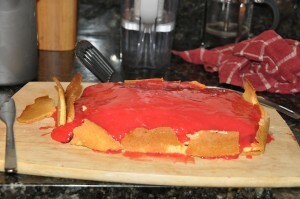 I used the leftover dough pieces to make walls to keep the pudding in place. 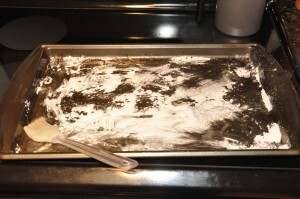 Place the cake in the fridge overnight. Then the next day, use a wet knife to cut into rectangles or squares. Decorate with whipped cream. Enjoy! Thanks for the suggestion, Dennis. I am personally not a big fan of those fillings (way too sweet for my taste!) but if they work for your wife, that’s great. What filling would she use here? The top of this cake is like nothing I have tasted in the US. 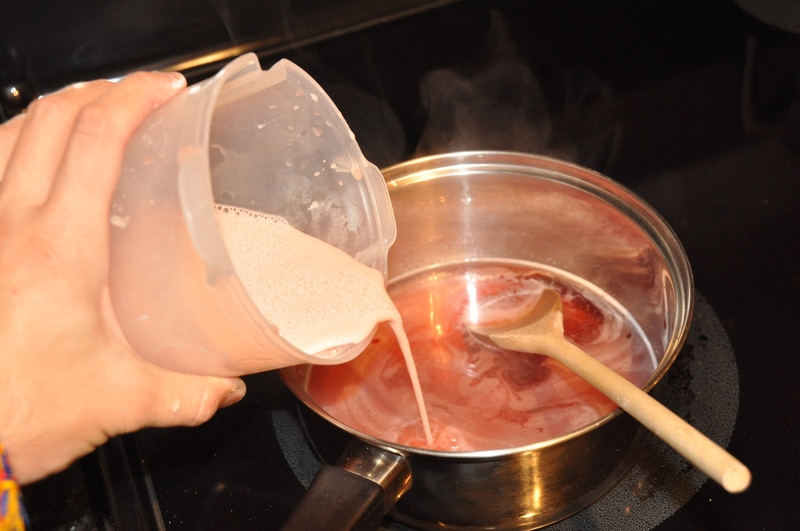 It’s basically a strawberry pudding made with only a small amount of milk. The original recipe actually did not call for any milk at all but I added a bit since I thought it improved the taste. My favorite Slovakian (my dance teacher) is having a birthday next week and I wanted to make him a traditional Slovakian birthday cake because he says that here in the US, he can’t find any cakes that don’t have flour in them. He loves hazelnut so I was wondering if you have any recipes for hazelnut cakes without flour?